The simplest way to carry around the documents that you want to use with Tails encrypted is to use the encrypted persistent storage. You can create other encrypted volumes using LUKS to encrypt, for example, another USB stick or an external hard disk. LUKS is the standard for disk encryption in Linux. 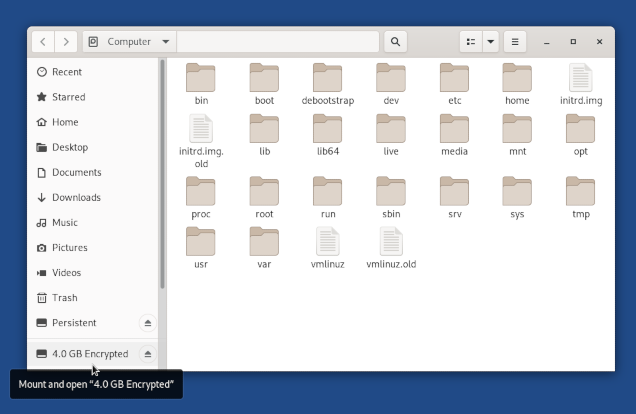 GNOME Disks allows you to create encrypted volumes. Die GNOME-Arbeitsumgebung erlaubt es Ihnen, verschlüsselte Laufwerke zu öffnen. You can also open VeraCrypt encrypted volumes in Tails. VeraCrypt is a disk encryption tool for Windows, macOS, and Linux. See our documentation about VeraCrypt. 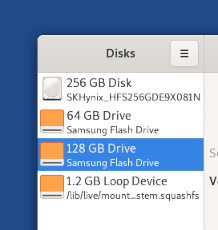 To open GNOME Disks choose Applications ▸ Utilities ▸ Disks. Disks lists all the current storage devices on the left side of the screen. Schließen Sie das externe Speichermedium an, welches Sie verwenden möchten. Überprüfen Sie, dass die Beschreibung des Mediums auf der rechten Seite des Bildschirms Ihrem Medium entspricht: das Modell, die Größe, usw. Click on the button in the titlebar and choose Format Disk… to erase all the existing partitions on the device. If you want to erase all data securely, choose to Overwrite existing data with zeroes in the Erase drop-down list. Choose Compatible with all systems and devices (MBR/DOS) in the Partitioning drop-down list. In the confirmation dialog, make sure that the device is correct. Click Format to confirm. Click on the button to create a new partition on the device. Partition Size: you can create a partition on the whole device or only on part of it. In this example we are creating a partition of 4.0 GB on a device of 8.1 GB. Type: choose Encrypted, compatible with Linux systems (LUKS + Ext4) from the drop-down list. Name: you can set a name for the partition. This name remains invisible until the partition is open but can help you to identify it during use. Passphrase: type a passphrase for the encrypted partition and repeat it to confirm. If an error occurs while creating the new partition, try to unplug the device, restart GNOME Disks, and follow all steps again from the beginning. If you want to create another partition in the free space on the device, click on the free space and then click on the button again. You can open this new partition from the sidebar of the file browser with the name you gave it. After opening the partition with the file browser, you can also access it from the Places menu. When plugging in a device containing an encrypted partition, Tails does not open the partition automatically but you can do so from the file browser. Choose Places ▸ Computer to open the file browser. Click on the encrypted partition that you want to open in the sidebar. Enter the passphrase of the partition in the password prompt and click Unlock. To close the partition after you finished using it, click on the button next to the partition in the sidebar of the file browser. Solche verschlüsselte Laufwerke sind nicht versteckt. Eine angreifende Person im Besitz des Mediums kann herausfinden, dass sich ein verschlüsseltes Laufwerk darauf befindet. Ziehen Sie in Erwägung, dass Sie gezwungen oder hereingelegt werden könnten, dass Passwort herauszugeben. It is possible to open such encrypted volumes from other operating systems. But, doing so might compromise the security provided by Tails. Plug in the external storage device containing the encrypted partition that you want to change the passphrase for. Check that the description of the device on the right side of the screen corresponds to your device: its brand, its size, etc. Click on the partition displaying a at the bottom-right corner.